While some students spent the summer reveling in the break from classes, Bryan A. Hum (International Studies, Political Science ‘13) and Micah Khater (Senior, History) were hard at work as interns with the National Endowment for the Humanities Office of White House and Congressional Affairs. 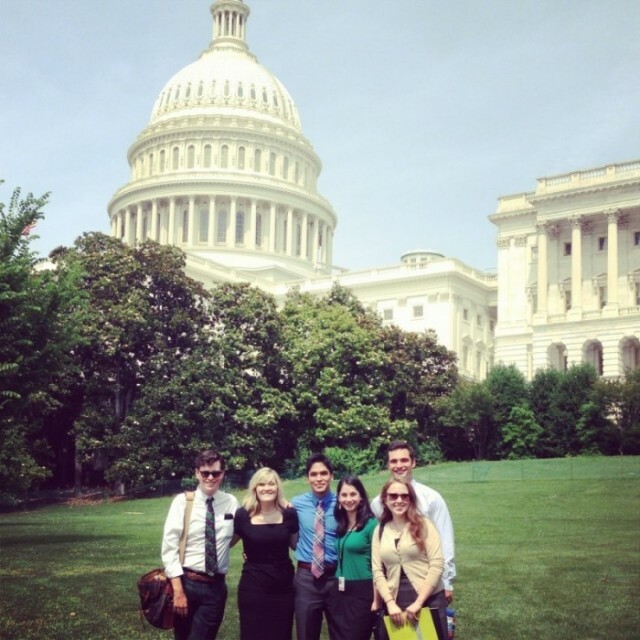 Bryan A Hum (International Studies, Poli Sci ’13) and Micah Khater (Senior, History) at an event during their internships with the National Endowment for the Humanities during the summer of 2013. Each year, the NEH receives approximately 250 applications for their internship program, and the Office of White House and Congressional Affairs selects two to five applicants, depending on the organization’s needs and the strengths of the applicant pool. Hum and Khater were both selected. Hum and Khater, along with other interns, helped with the general editing and organization of the aesthetics of the reports. In addition to serving as a primary writer and editor for the impact reports, Khater served as a chief editor for the agency’s blog for congressional staffers. She also worked with senior staff to envision and plan events between the NEH and external institutions as well as to brainstorm ways to improve communication between the organization and the staff on the Hill. Bryan A. Hum and Micah Khater worked alongside other interns on a series of projects at the NEH’s office in Washington, D.C.
Hum, who served as the student liaison on the CHASS Advisory Board during his senior year at NC State, worked as an editor on the impact reports. He also helped pilot a Google+ hangout series that enabled individuals to participate in group dialogues, regardless of location, through the use of emerging technology. The new series facilitates discussion on ways in which the humanities intersect with STEM. During Hum’s internship, these virtual meetings brought together federal agencies, university presidents, members of Congress, and the White House Office and Science and Technology Policy. Hum and Khater’s projects often brought them to Capitol Hill for meetings with staffers. Hum credits his internship in Senator Kay Hagan’s office the previous summer for putting him at ease on the Hill as he discussed the work and initiatives of the NEH. “Most of all, I have taken away just how important the humanities have been, how useful they are now, and how crucial they will be to the advancement of society in the coming years,” says Hum. Hum and Khater weren’t the only CHASS representatives who journeyed to the Hill this summer; Dean Braden stopped in D.C. to attend “The Heart of the Matter,” an event hosted by the American Academy of Arts and Sciences’ Commission on the Humanities and Social Sciences, and met with Hum and Khater before the event. With insight and experience gained from their experiences with the NEH this summer, both continue their studies this fall. Khater is back on campus for her senior year as a Caldwell fellow, while Hum is in his first year at the Albany Law School of Union University.